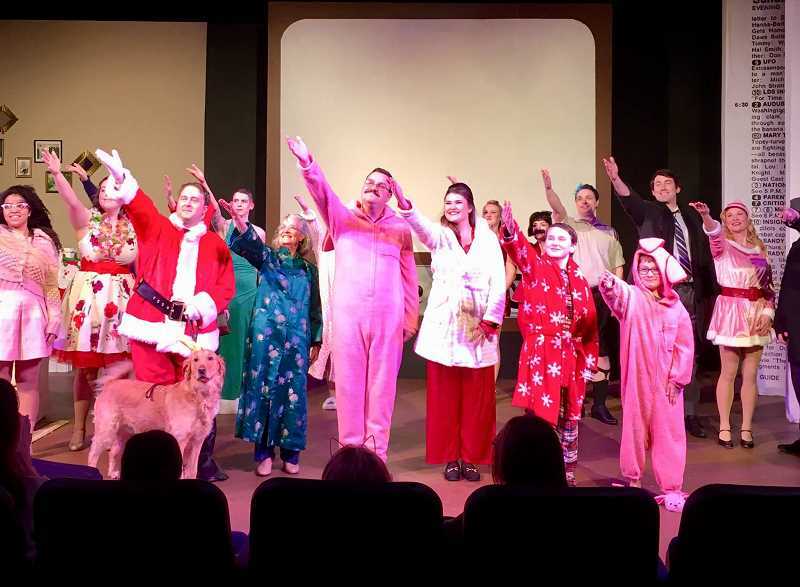 Tina Arth reviews HART's production of 'Holly Jolly Family Christmas Show,' with performances until Dec. 16. Some things just never change. A great example is HART Theatre's 2018 production of "Holly Jolly Family Christmas Show" — yes, there have been numbers added and others removed since the show's 2016 debut, and yes, there are many new cast members, but the heart of the show is intact. As in its earlier incarnation, on a purely qualitative level, it is not the "best" Christmas show of the season — but it's still one of the most fun, and it's a true family show, just dripping with appeal for audiences of all ages. While things on stage occasionally get pretty frantic, Chris Byrne (co-director/choreographer) and Sandy Libonati (co-director/vocal director) have done a great job of corralling and organizing a lot of bodies and voices in the relatively small space available at HART. "Holly Jolly" is an original show by local singers/dancers/actors Chris Byrne and Sarah Fuller. The wraparound script tells the story of Christmas Eve 1974 with the Hart family, Phil, Barb, kids Greg and Jeff, with the 2018 addition of grandmother Gammy. While a Christmas tree lurks in the background, the family is nestled around the television, preferring "TV Guide's" cornucopia of holiday specials to traditions like "The Night Before Christmas." The real meat of the show is a montage of live action performances, backed up by video clips of holiday classic shows on an enormous TV screen. Whether you're a fan of The Grinch, "It's a Wonderful Life," Rudolph, Charlie Brown, "I Love Lucy," Andy Williams, David Bowie or Gammy's special eggnog–free eggnog recipe (hey, at least it's vegan! ), there's something for everyone. A series of hilariously retro actual TV ads are the star on top of the tree — a reminder for some of us of the primitive and naïve roots of television, and a shock for younger audience members that we were ever that lame (yes, we were!). With twenty cast members playing 75-plus roles, there's no way to acknowledge every bright spot in the show, but a few actors absolutely demand special recognition. For across-the-board excellence in diverse roles, there's Elise Byrne, Emma Heesacker, Riley Irvine, Rachel Roberts, Nick Serrone, Kieran Thomas, and Max Powell. Powell's stunning take on Cher is a complete showstopper, Roberts does a marvelously petulant Lucy van Pelt and Byrne's Heat Miser is unforgettable. HART newcomer Thomas' versatility makes him a real find — he channels Frank Sinatra's energy and Ricky Ricardo's Cuban flair, and his David Bowie was the unchallenged high point of the show (until Cher appeared). Henry Bieker and Olin Dawson show off serious comic chops as the young Hart boys, especially with their melodramatic despair and fluid physicality as bored children. Holly Popkins (as mom Barb Hart) is another welcome newcomer (to HART, and to the USA) with perhaps the best solo voice in the show — and her "White Christmas" duet with husband Phil (Tanner Morton) is exquisite. An unexpected but delightful addition was the cameo by Sandy Libonati's dog, Jeter, playing Max in the Whoville scene — I would have loved to see more of him, but he's a youngster and may not have been up for a larger role. Master carpenter William Crawford's fine set creates a believable family living room while leaving plenty of space for the TV performers, and light, sound and video operators William Ferguson and Rebecca Glass stay on top of a truly challenging show. The aforementioned 75-plus roles require almost as many costumes, and in addition to co-directing, Chris Byrne also takes the lead on that critical role. Many of this year's holiday shows are only peripherally related to Christmas, which makes "Holly Jolly" an utterly welcome way to rev up your seasonal spirit. Grab the family or hook up with a group of like-minded friends and head to HART, but save Gammy's special eggnog for post-show relaxation in the warmth and safety of your own home! "Holly Jolly Family Christmas Show" is playing at the HART Theatre, 185 S.E. Washington St., Hillsboro through Sunday, Dec. 16, with performances Friday and Saturday at 7:30 p.m. and Sunday at 2 p.m.